This excerpt from Chapter Five of Ice Cream Social describes a speech Ben Cohen gave at Harvard twenty years ago, long before “corporate social responsibility” became a buzzword. The full text of the speech is well worth reading, too. The Harvard elites squirmed in their seats, and Ben was delighted. He described the company’s campaign to combat bovine growth hormone in the face of legal pressure from Monsanto. He cited one study that estimated the government spent more on welfare for corporations than it did on welfare to the poor, and that the social costs of white-collar crime rivaled those of crime in the streets. 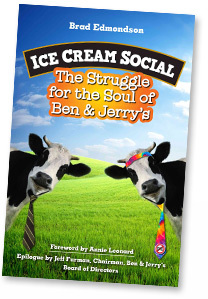 While Ben & Jerry’s was far from perfect, he said, it was willing to take “a no-holds-barred look at ourselves” and publish the results for all to see. The company’s social reputation, he said, didn’t hurt its profitability—in fact, it was the key to its success. Such advocacy is great complement to the work by others sectors of society, and reveals the misinformation disseminated by many large corporations.